[Aug. 29 2010] “Top Mongolian officials donned dark green baseball caps reading "Save our planet" and set up chairs and tables in the sands of the Gobi desert for a Cabinet meeting aimed at drawing attention to climate change. The meeting of 12 government ministers was held in scorching heat Friday in Gashuunii Khooloi, a sandy valley in South Gobi province, about 415 miles (670 kilometers) south of Ulan-Bator, the country's capital. The ministers, dressed in suits and ties, arrived in the desert in jeeps after a 15-hour journey. Officials planted a Mongolian flag in the ground, set up long tables and chairs in the fine, golden sand and discussed climate change against the backdrop of a vast expanse of desert and a bright blue sky. "Mongolia is feeling the impact of global climate change," Prime Minister Batbold Sukhbaatar said at the one-hour meeting. Batbold pointed to the recent winter as an example of problems Mongolia faces. The winter was the harshest in decades and a fifth of the country's livestock died. The government blames global warming for a decrease in rainfall and says that rising average temperatures have caused many rivers and springs to dry up and snow cover to melt. It also says the frequency of natural disasters and drought has jumped. The Mongolian government blames global warming for the harsh winter and desertification. 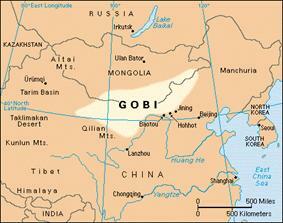 The Gobi desert covers southern Mongolia and the Inner Mongolia region of China. 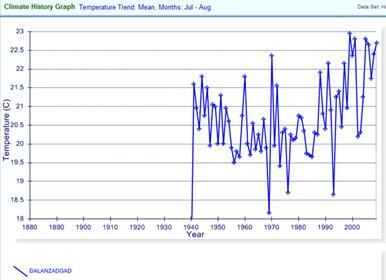 As far as temperature data goes, Mongolia has a lack of history. The earliest stations in the NOAA GHCN or Hadley databases for Mongolia start in 1940. The following figure shows average July – August temperatures for Dalanzadgad in the Gobi Desert from the Hadley CRUTEM3 data (plotted at http://www.appinsys.com/GlobalWarming/climate.aspx). 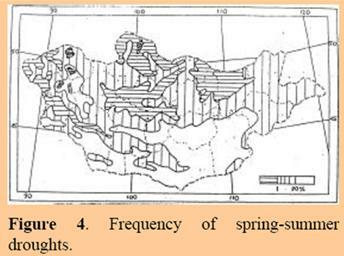 The following information is from a 1998 report “Desertification in Mongolia” by Zambyn Batjargal of the National Agency for Meteorology, Hydrology and Environment Monitoring, Mongolia [http://www.rala.is/rade/ralareport/Batjargal.pdf]. A 2007 study (“Integrated desertification assessment in Southern Mongolia” [http://deposit.ddb.de/cgi-bin/dokserv?idn=987533290&dok_var=d1&dok_ext=pdf&filename=987533290.pdf]) examined the Bulgan soum in the Gobi area of southern Mongolia and states “Climatic variations, low variable rainfall, and dust storms overlaid by unsustainable human land-use practices, primarily poorly managed livestock grazing, are contributing to accelerated desertification.” The following figure shows the study area as well as the degradation from 1990-2005. 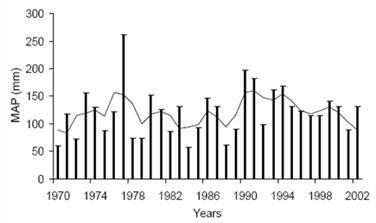 The following figures are from the above study, which states: “Drought, i.e., a shortage of precipitation over an extended period, is a regular and recurrent feature of the Gobi desert climate in Mongolia.” (i.e. the Gobi Desert is a desert). The following figure shows mean annual precipitation (MAP in mm) for 1970 to 2002 for the Bulgan soum area of the Gobi (thin line is 3-year moving average). There has been no trend in precipitation over the period. 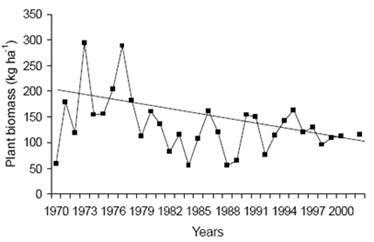 The following figure shows the plant biomass trend for the area. 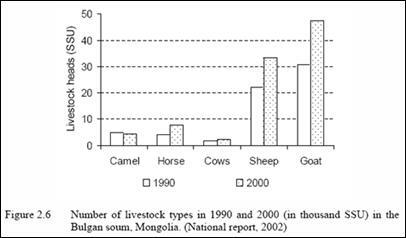 While rainfall has not decreased, the number of range-degrading livestock has greatly increased. The Mongolian government wants you to pay them because you drive a car and western idiots like Obama pretend that this is the reason that desertification is occurring in the Gobi desert, not that the Mongolian population is overgrazing the land with livestock.